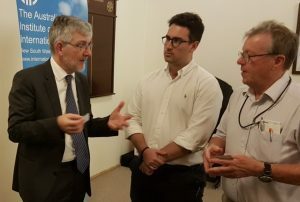 On Tuesday 9th April, Dr Adi Paterson, the CEO of Australia’s Nuclear Science and Technology Organisation (ANSTO), spoke to the Institute about the important work conducted at ANSTO in nuclear research and developing effective nuclear-related government policy. Dr Paterson has been CEO of ANSTO for over ten years, after having worked to reconstruct South Africa’s systems of scientific innovation post-apartheid. In his detailed and fascinating talk Dr Paterson, as a firm believer in public outreach to increase support for nuclear research programs, sought to enlighten the audience about the projects conducted at ANSTO and their positive effects on not only Australian society, but also the world. Dr Paterson sees his role as demystifying the work conducted at ANSTO. Combating the longstanding aversion to anything ‘nuclear’ has been the target of his tenure as CEO. He has focused on the possibilities and achievements of nuclear medicine, framing nuclear research in a positive light. New nuclear medical technologies are constantly being developed to treat a variety of health conditions. Approximately two-thirds of Australians will benefit from nuclear medicine in their lifetimes, and most will have reason to thank ANSTO for their treatment. Australia is a world leader in nuclear medicine and synchrotron-related research (the Australian synchrotron produces intense beams of light travelling at just under the speed of light to explore the composition of human tissue, plants, metals and other materials). He also noted that Australia is catching up with the rest of the world in such areas as particle therapy (precisely targeting tumours). Dr Paterson emphasised the need to maintain support for ANSTO to continue to make advances in fields of research that benefit Australian society, the Asia-Pacific region and the wider world. These advances are due in large part to ANSTO’s world class nuclear research facilities in both Sydney and Melbourne. Two examples of Australia’s international outreach were given by Dr Paterson: first, Australia’s acceptance into the Generation IV International Forum, despite not being a nuclear power, as a result of the research capabilities and knowledge ANSTO holds; and second, the bilateral research between Australia and Sri Lanka in identifying and treating a chronic and prevalent kidney disease affecting Sri Lankans and other Asian populations. Both of these examples are evidence of Australian ‘soft-power’ and peaceful uses of nuclear research. In response to questions, Dr Paterson argued for the safety of nuclear research operations, both for their human operators and for the environment. He defended Australia’s waste disposal programs. He also argued in favour of nuclear energy sources as viable and reliable alternatives to fossil fuels. Dr Paterson’s enthusiasm for the benefits of future nuclear technologies shone through his presentation, with an optimism that perhaps only a scientist could possess.